The World Cup is over but conversations about the different countries that took part have given us lots of opportunities for learning geography. We’ve been poring over the pages in Maps by Aleksandra Mizielinska and Daniel Mizielinski, it’s a great book for introducing not only countries but also their flags, languages and landmarks. 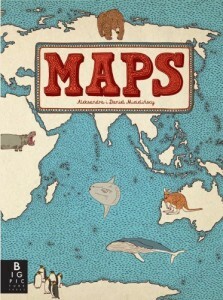 Maps is a big book. It’s a lying out, spread over the floor, poring over each page kind of book and there are so many wonderful details to find in the pictures that it is a great book for sharing. The first end paper shows a map of the world and indicates which page each country is shown on (not every country is included in the book). The final endpapers are equally fascinating, two double page spreads show 197 world flags. A world map shows each continent and then we move on to Europe where we are given information about the number of countries on the continent, its population and size. 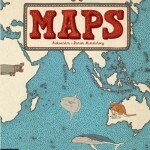 Following on are wonderfully detailed and beautifully illustrated maps of each country. The name of the country in its own language is given as is the language spoken, the capital city, population and area. Then you can spend hours looking at the beautifully illustrated animals that live there, discover national landmarks and interesting places, read about local delicacies and traditional foods and meet famous people from the country’s history. After Europe we move on to Asia and the other continents, each page following the same format and providing fascinating facts. The illustrations in Maps are beautiful. Muted earthy browns, greys and blues are used and each map is covered with pictures and their related explanatory text. The book is a fantastic resource and provides great learning opportunities for children and adults. It’s a great stimulus for learning about different countries and could also be used as an icebreaker with non native English speakers who could introduce their classmates to the page showing their native country. A fascinating, beautifully illustrated book which provides hours of enjoyment and learning for all the family. 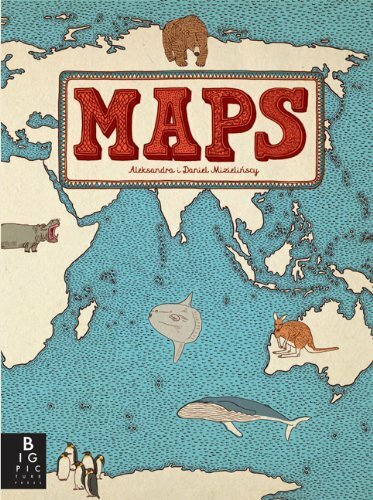 There is also a Maps Activity book which includes activities to consolidate geographical knowledge. I love this book! I’ve got it in German and it’s so cute. All those little boys and girls in their traditional clothing. So much to discover. I have also learnt so much from this book, an amazing amount of research has gone into it.